My kids have been clamoring for freshly baked Chocolate Chip Cookies. My sweet-tooth of a daughter would settle for the cookie dough that comes ready to bake, but this is my favorite from scratch recipe. I like to use the Ghirardelli brand semi sweet chocolate chips, because I am a chocolate snob. Feel free to use any other brand though if you are less picky. Place the flour, baking soda, and salt in a medium bowl and stir to combine. Preheat oven to 375 F.
Mix the butter, eggs, vanilla, brown and white sugar in a large mixing bowl until well combined and creamy. Add 1/3 of the flour mixture at at time and start to mix on low (or it will coat your kitchen with a nice coating of flour-it may look like snow, but trust me it’s not nearly as pretty as it sounds!) Increase the speed of the mixer to medium and make sure it is nicely combined, but you don’t need to over-beat it. Add chocolate chips and chopped pecans and mix just until combined. Drop the dough with a teaspoon on a baking sheet. Depending on the size of the pan, you should fit 12-15 cookies per pan. Bake at 375 F for 9-11 minutes or until golden brown. When the cookies are done, take them from the oven, but do not immediately remove them from the sheet pan. Let them sit for a few minutes so they firm up a little before you remove them to cool on a wire rack completely. Store them in an air tight container if they make it to storage at all! 🙂 Best served with a tall glass of cold milk. Categories: Baking - Cookies, Dessert - Cookies, Ethnic - American, Kid's can cook! | Tags: Chocolate Chip Cookies, Cookies | Permalink. 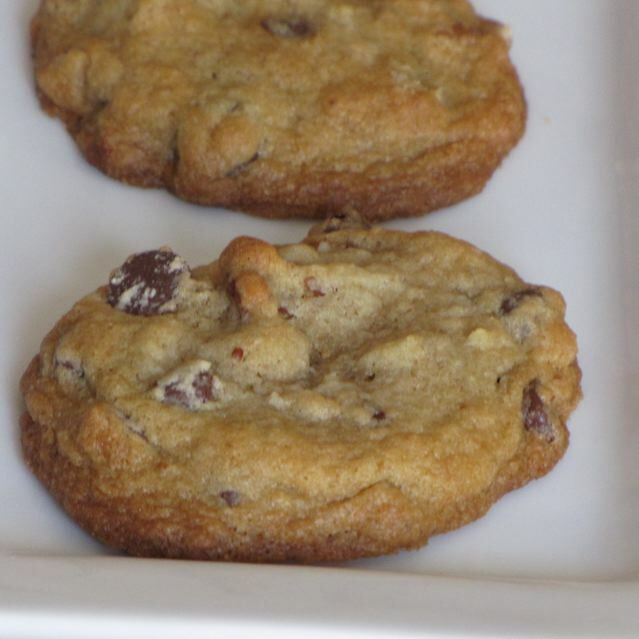 You can’t beat a tasty chocolate chip cookie… they look tasty!